One of the most significant symptoms of Parkinson’s disease is difficulty with eating in the later stages. As your senior loved one’s caregiver, there are many things you can do to overcome this challenge and make sure your loved one eats nutritious meals. These five tips make feeding an aging parent with Parkinson’s easier and more effective so he or she gets the most out of each meal. Parkinson’s disease affects the ability to control fine motor movements that are necessary to perform tasks such as grasping a fork. Adaptive utensils include options such as silverware with straps that minimize dropping and counteract tremors. You can also find rocker knives to make cutting up ingredients easier and weighted cups that are difficult to knock over. Minimizing frustrations at mealtimes may help your loved one stay motivated to eat. Many seniors in the early stages of Parkinson’s are able to live on their own, but grocery shopping and preparing nutritious meals can be challenging. Aging adults who require assistance with the tasks of daily living can benefit from reliable elder care. Toronto, ON, families trust Home Care Assistance to provide the high-quality care their elderly loved ones need and deserve. Our caregivers are trained to help seniors prevent and manage serious illnesses and encourage them to make healthier decisions as they age. Seniors with muscular weakness may find it difficult to maintain the ideal posture for eating. Ideally, your loved one should be sitting up straight with the legs parallel to the floor so his or her body forms a 90-degree angle. If your loved one cannot maintain this position, use cushions to prop him or her up and reduce the risk of choking and digestive discomfort during the meal. Once Parkinson’s disease affects your loved one’s ability to chew, you should never try to hurry through a meal. Instead, plan for plenty of time to help your loved one get the food to his or her mouth and completely chew each bite before swallowing. Your loved one will also be more likely to try to eat independently if he or she isn’t rushed for time. Difficulty chewing and other eating issues in the advanced stages of Parkinson’s disease can make caring for seniors increasingly challenging. If you’re the primary family caregiver for a senior loved one living in Toronto, live-in care is available if your loved one’s health has become too difficult to manage without professional expertise. At Home Care Assistance, we take measures to help seniors prevent illness and injury by assisting with exercise and mobility, preparing nutritious meals, helping with bathing and other personal hygiene tasks, and much more. The vision changes that occur with Parkinson’s can also make it difficult for seniors to identify their food or find it on their plate. This is especially true when the food is the same color as the plate, such as cauliflower on a white dish. Creating contrast between the food and the plate so your loved one can easily see each item may make it easier to pick the food up and stimulate a dwindling appetite. Your loved one’s food may need to be cut into small portions. Smaller pieces of food are easier to chew, and your loved one may be less overwhelmed at the sight of tinier chunks of food on the plate. You can also make chewing easier by steaming hard foods until they’re soft. If your loved one still has difficulty eating softened vegetables and meats, use a food processor to grind them down into a semi-liquid form that he or she can swallow. Caring for a loved one with advanced Parkinson’s can be extremely challenging, and a compassionate, professional caregiver can be a wonderful source of support. 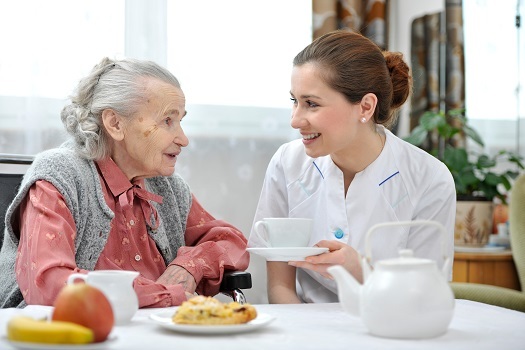 If your elderly loved one is living with a serious medical condition and needs help managing the tasks of daily living, reach out to Home Care Assistance, a Toronto at-home care agency you can trust. Our caregivers are available 24/7, there are no hidden fees in our contracts, and we offer a 100% satisfaction guarantee on all of our in-home care services. To create a customized home care plan for your loved one, call (416) 488-8777 today.